"Imagination Northwest" Art Project, Redmond WA. 'Imagination Northwest' is a large sized acrylic painting (35 feet wide x 6 feet high) I created for outdoor installation in Redmond. The project was commissioned by Redmond Town Center and facilitated by VALA Eastside. I selected 81 of these drawings (based on suitability) and used them as the basis for creating 75 fun, imaginary creatures that I then painted into the landscape. The picture below shows what the site looked like 'BEFORE' and what it looked like 'AFTER' I was done! The slideshow below shows the kid's original drawings (on the left) and my resulting creation (on the right). Congratulations to the 81 kids, listed below in alphabetical order, whose drawings were selected as inspiration for this project. Q. How long did it take you to paint such a large painting? A. This project took a little more than 12 weeks from start to finish. * 3 weeks of planning time, including researching materials for outdoor use and painting a 1/6th scale model. Q. Is this the largest painting you have ever painted? A. Yes, at the time I completed this project, this was my largest painting I have ever done. Q. My child submitted a drawing that was selected for the project. Can I obtain any kind of keepsake memento of my child's contribution? A. Yes. 8" x 10" color commemorative prints, SIGNED by the artist with a personal message, of your child's drawing and the corresponding artistic transformation are available on request only (with a modest charge to cover time and materials). Q. Is this a painting or a mural? What's the difference? A. Most outdoor murals are made with house paint and with rollers, large brushes, and often, spray paints. This project is very much a painting: done with brushed using only the finest quality artist paints. Brush size ranged from 2 mm to 3 inches. Q. How is this painting protected from the elements? A. The painting is done on exterior-grade plywood using acrylic paints, both of which are essentially weather-proof. The plywood is coated with primer. The painting is coated with transparent coatings and varnishes for UV safety. Only a limited range of light-safe colors were used for creating this painting. Q. How were you chosen for this project? A. Redmond Town Center desired to commission a permanent art installation for their site and VALA Eastside published a 'Call For Art' on their behalf, inviting local artists to apply and submit design proposals. There was a formal process to short-list and select an artist for the project through which I was fortunate to emerge as the selected artist. I had submitted several possible project ideas and the final concept is a result of combining two of those ideas: a northwestern landscape and kid-inspired creatures. Q. I am a commercial property owner. Can we commission you to create a unique whimsical mural for an indoor or outdoor location? A. Absolutely. As my experience with Redmond Town Center demonstrates, my whimsical art can uniquely activate any space to make it a popular destination for families and shoppers. Please e-mail me to discuss further. Q. Do you accept commissions for residential and indoor murals? A. Absolutely. See terms and conditions and then contact me. Q. I would like to come see this artwork. Where is it located? A. 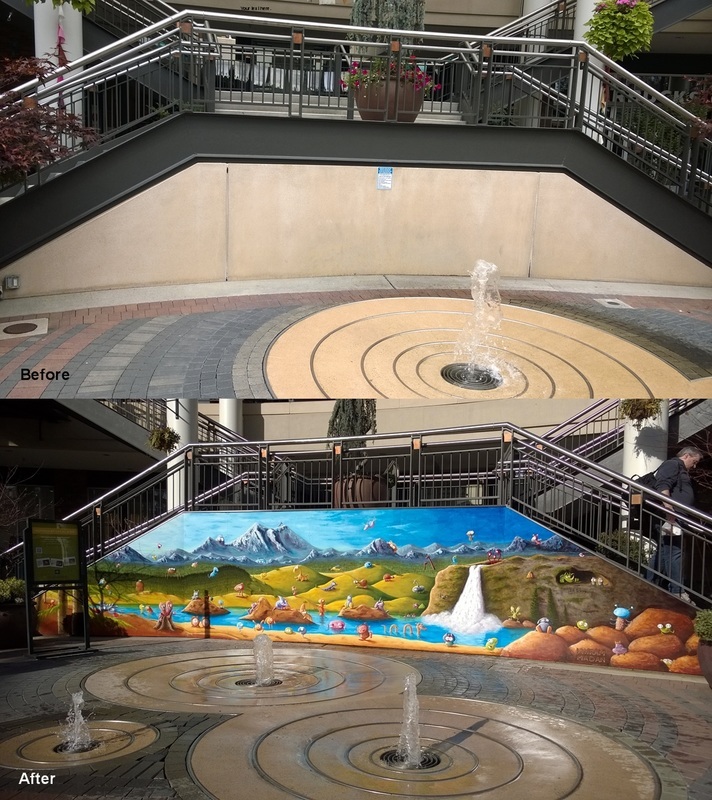 The artwork is located in the heart of Redmond Town Center in Redmond, WA. Click here for directions.